– For the third time in eight days and second time in 24 hours, it was race day for Spencer Pigot. It was a frustrating and early exit from the race for Pigot, who yesterday scored his first Top 10 finish of the year in Race 1. Today in Race 2, Pigot was sent into the wall by a rookie, eventually leading to retirement from the event and a 23rd place result. – Heavy rains descended upon the 2.35-mile, 13-turn street circuit in the morning, but abated prior to the start of qualifying. However, the track remained wet and all competitors qualified on Firestone’s wet tire. The field was split into the same groups as yesterday; today, Group 1 was the second to go out, including Pigot. His 12-minute session was interrupted by a red flag, but with the five minutes of guaranteed green time satisfied, qualifying came to a close. Alexander Rossi, the pole sitter, came from Group 1, giving Pigot the 15th position on today’s starting grid. – An accident with the pace car on the opening parade lap brought all the field into the pit lane for a lengthy period. Treated as a red flag condition, crews were not allowed to make any changes to the cars. Once a back up pace car was prepared, the parade laps resumed and the green flag flew the second time by. – However, the race did not stay green for long. In Turn 3 of the first lap, Pigot was hit by Santino Ferrucci, a rookie competing in his first Verizon IndyCar Series event weekend. Two turns later, Ferruci hit Pigot once again, this time spinning Pigot into the Turn 5 wall. The AMR INDYCAR Safety Team re-fired Pigot and he brought the No. 21 Fuzzy’s Vodka Chevrolet in with rear suspension damage. The repairs required three laps to be completed and Pigot fell to 23rd, the last car running. – Ferrucci spun on his own on Lap 21, creating a debris field as he drug his broken front wing along the track. Pigot ran through the debris, puncturing his right front tire. Another unscheduled pit stop meant Pigot would fall an additional lap behind the field. With no more points to gain, the No. 21 was retired from Race 2 on Lap 22. 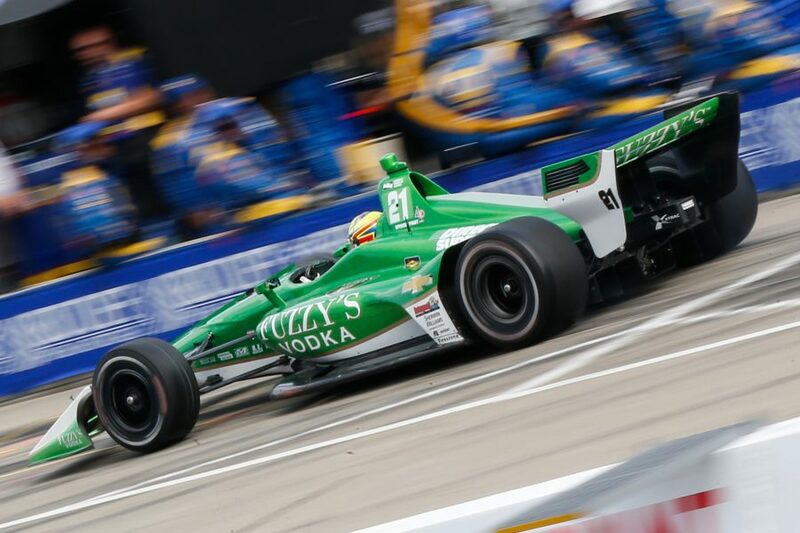 – Ed Carpenter Racing will return to work at their Indianapolis-based race shop tomorrow to prepare a pair of Fuzzy’s Vodka Chevrolets for next Saturday’s DXC Technology 600 at the high-speed oval of Texas Motor Speedway. The 248-lap race will take place under the lights on Saturday, June 9 with an NBC Sports Network broadcast beginning at 8 p.m. ET.